There’s always a but. On my first visit, I was excited and the cold noodle, cold dipping sauce combination caught my eye. Served with a mixed prawn and vegetable tempura, I was salivating just at the thought of it. First, I was instructed that I had to try the onsen tomago. 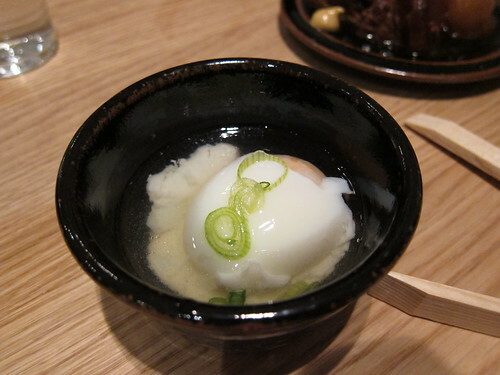 Named after the hot springs that the eggs are normally cooked in, what you get is an egg which has been cooked at a low temperature for a long time, giving the white a silky texture, whilst still cooked, with the yolk runny and rich. Served in dashi, a light fish stock, I wasn’t entirely sure what I was meant to do with this (shush those who thought “eat it”), but I gulped it down and was pleased with the interesting textures and flavour. 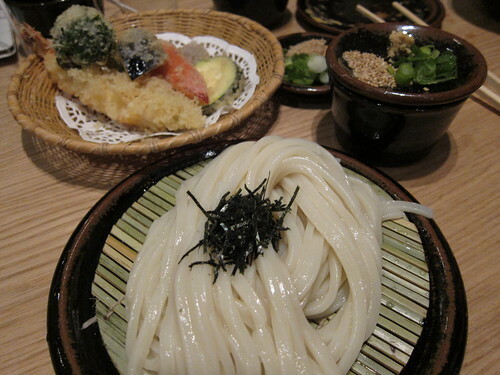 The udon was another interesting texture. Chewing on one cold was how I imagine chewing on an earthworm would feel like, with an entirely nondescript taste. The dipping sauce was light but very wet and just helped make something rather slimy into something really slippery. In all honesty, it wasn’t terrible; I just found it hard to understand how one person was expected to devour a plateful of these rubbery beasties. I hoped that the accompanying tempura would lighten my rather one dimensional meal, and although the change in texture (with a great crunch from an excellent and light tempura) was very welcome, the wholly intact poo chute of my prawn was not. The minute I lay my eyes on it, I just couldn’t face any more. I put my poor meal down to my eternal nemesis, the bad menu choice, and was determined to get it right. The next time I returned, I was accompanied by my udon aficionado and decided that a choice of hot noodles and hot soup would change my mind about the place. 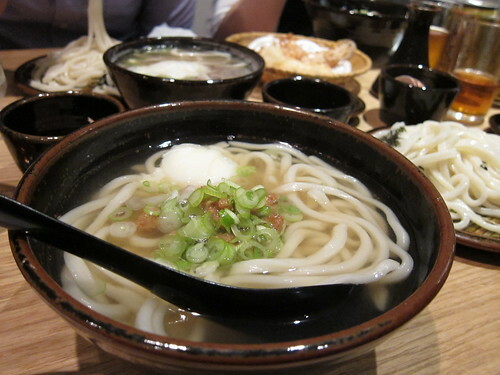 The pork and miso (buta miso) combination incorporated the udon noodles in a steaming hot broth and generous portions of minced pork and miso paste, muddying the broth but intensifying the flavour. I was much happier with this, with the chewy udon noodles softening in the warm broth, but couldn’t help thinking that this was just a nice bowl of noodles. I despair when I can’t quite see what everyone else does. But I guess that’s the beauty of being an individual, we all like and dislike different things. There is nothing wrong or offensive about Koya, just nothing that exciting. With mains around the £10 mark, it’s not going to break the bank, but go for the hot stuff, that’s definitely where it’s at. Don't feel bad about not seeing what others do - it's your objectivity and apparent immunity to hype which make your posts so interesting! I did find myself thinking when I read the initial wave of raves that 'It's just a bloody noodle bar, what IS all the fuss about?' so it's good to see that someone who's actually been - I remain in no rush - shares that view. Wasn't a fan of Koya as well myself. Didn't help that it was packed when I was there and the entire meal felt rushed. But a Japanese gentleman sitting beside me was slurping merrily on his udon with a grin on his face all the while... Koya must be doing something right. Koya isn't going to be for everyone. Not every restaurant is. For myself they serve the best noodles I've had outside of Asia (and Momofuko in NYC). This is one place where the hype has been lived up to, but it won't be for everyone. @Lizzie - More udon for you! @HW - Thanks Hugh, kind words! My companions all love it so still worth checking out, just not my cup of tea. @London Chow - It has a lot of fans who keep returning. 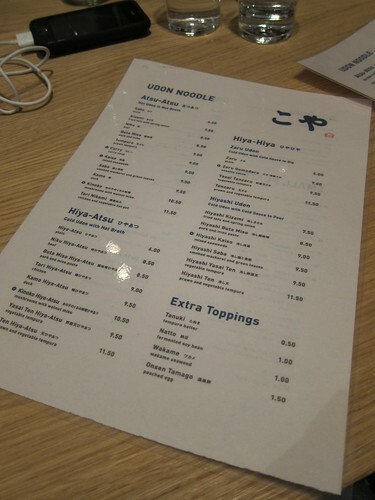 I think Koya is a good little place, I just can't get excited by udon. @Catty - Oh, Yalla Yalla is ace. If very slow. I went to Koya for the second time yesterday. They do some good things, some bad. I liked the noodles and the walnut miso but their rice was absolutely awful. To me, even though I know it specialises in noodles, the rice is a litmus test for a Japanese restaurant. It was soggy, tasteless. Also the tempura was allright but nothing to write home about. Somebody Japanese please explain the point and purpose of the traditional bland tasteless sauce that goes with it? @Catty, have you tried pho outside of London? London pho is pretty tasteless.